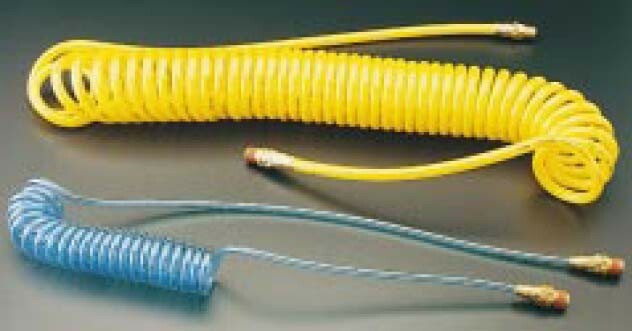 BENEFITS: Greater durability than Nylon or Hytrel recoil hoses due to exceptional wear characteristics. Longer life expectancy due to kink resistant properties. Superior recoil memory due to elastic properties. Working length is approximately 80-90% of hose length. Hoses are preassembled with reusable brass fittings reducing assembly time. 5/32" ID hose is ideal for use with Foster blow guns. SPECIFICATIONS: Temperature Range: -40°F to +125°F. Working Pressure: 125 PSIG @ 75°F. ORDERING INFORMATION: Colors: Available in Transparent Blue & Yellow. ID x OD 1/4 in. x 3/8 in.